Welcome to 34BigPeople, where you get to know the members of 34BigThings! We thought that it would be great for the outside world to get to meet the super-talented people that breathe life to our games. So, we are going to introduce them to you in a series of relaxed, casual interviews. 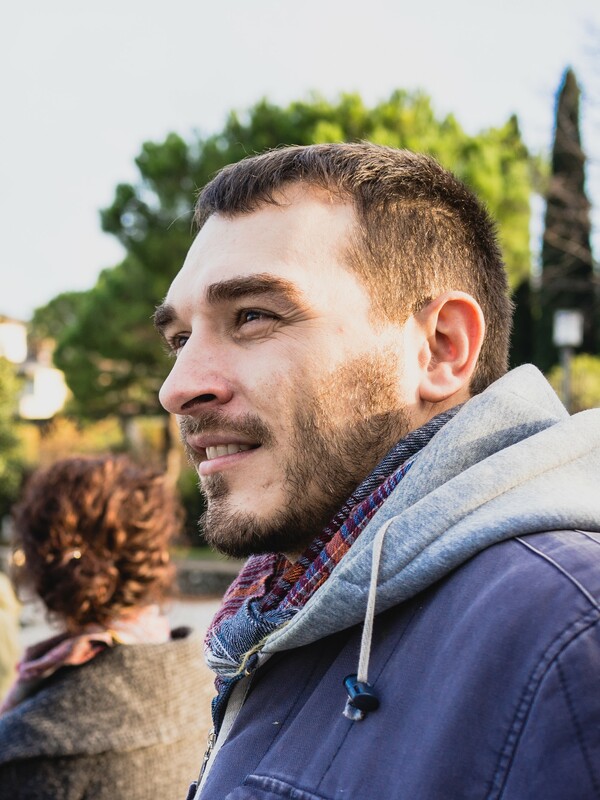 The first person we are going to introduce you to is Ivano Zanchetta, one of our Game Directors. So, Ivano, where are you from? I’m from Rivoli, a gorgeous little town just outside of Turin. What was the first video game you played? Rygar, on the Commodore 64. It was a pretty frenetic platformer/shooter (for the time, at least!). What is your favorite genre of games? I do not have one! I love all sorts of games: narrative games, action games, sports, FPS, you name it. If there is something I do not like to play, it is very complicated strategy and simulation games. They seem more like work than entertainment to me. I studied IT Engineering here in Turin, at the Polytechnical University. As soon as I graduated, however, I started getting distracted: while I was studying, I got interested in cinema and acting, especially directing. So I started working in that sector in my free time. From 2006 to 2009 I worked as a programmer for Motorola, where I developed drivers for phones. In 2009 the Motorola firm I was working for close down, so I decided to take a leap into the unknown: I went to Treviso and started studying 3D modeling at Big Rock. After that, I started working as a freelance game developer, working for a small, UK-based studio called Red Frog in various roles. When did you decide that you wanted to make games? When I was a kid, I distinctly remember thinking: “When I grow up, I want to make video games!”. But I think that growing up, I forgot about it. The idea only came back to me before going to Treviso. In a way, I feel like my life went full circle and brought me back to what I always wanted to do. When did you enter 34BigThings? It all started in 2014: that year, there was the first Game Jam organized here in Turin. I did not know anyone in Turin that was making games except myself, so going there was like looking for some aliens like me. There I met Valerio (34BigThings’ CEO) and Beppe (34BigThings’ Lead Game Designer), along with the founding members of TinyBull Studios, and we won the jam that year with the prototype of what would become, years later, the first big game from TinyBull, Blind. Sometime after the Jam, Valerio contacted me and I entered in 34BigThings, and in late 2015 I was promoted to Game Director for Redout to help managing the development process with Valerio. In the same year, I decided to invest in the company I was working for, and I became an associate. Do you have any personal projects you are working on right now? All of my work goes in my role as Game Director here at 34BigThings. However, I still enjoy acting from time to time, and in particular improvised acting. Thank you for your time, Ivano! 34BigThings' rookie Social Media Manager. A multilingual mess of word-wrangling tendencies. Occasional writer and translator. Would love to play Redout, but it crashes at startup with a LowLevelFatalError every time. Do you know where I can get support?